Ask any random passerby about French cuisine in Singapore and the few he or she can probably list out are Les Amis & maybe The French Stall. The general consensus is that French food here is uncommon, ostentatious and lavish, left to the upper rungs of society while posing barriers of entry for some who equate French dining to Fine dining. Generally, such claims have been hard to refute but finally, I have found one such exception in the Black Sheep Cafe. 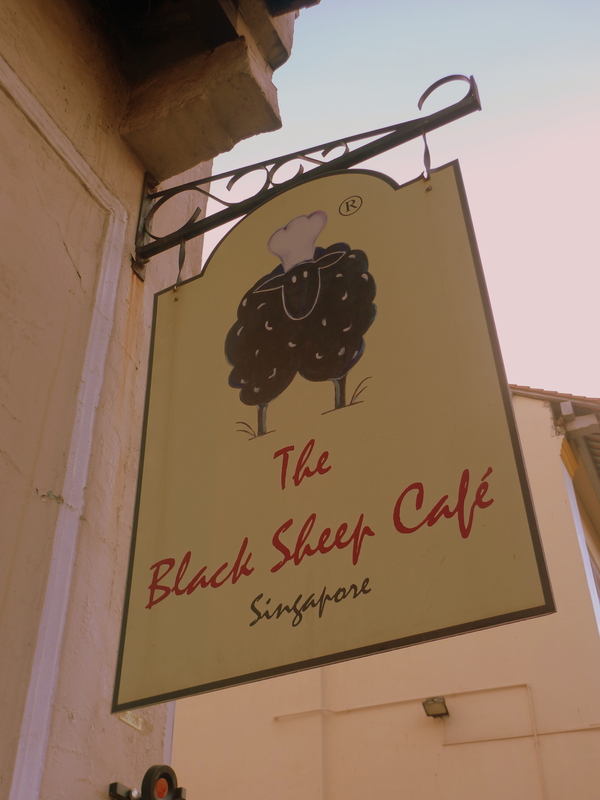 Why it is named so I do not know, perhaps it’s because it’s smack in Little India opposite a mosque, or it’s because Head Chef Ratha is of Indian descent, giving rise to “BLACK” Sheep Cafe. It’s pretty rare to find an Indian Chef specializing in French, and I did have my reservations to the “authenticity” of the food initially. Then again, Black Sheep Cafe has been making waves in the online food community for quite some time now and I was eager to try it out. The cafe looks modest and unassuming with a max capacity of 20 pax so reservations are recommended. 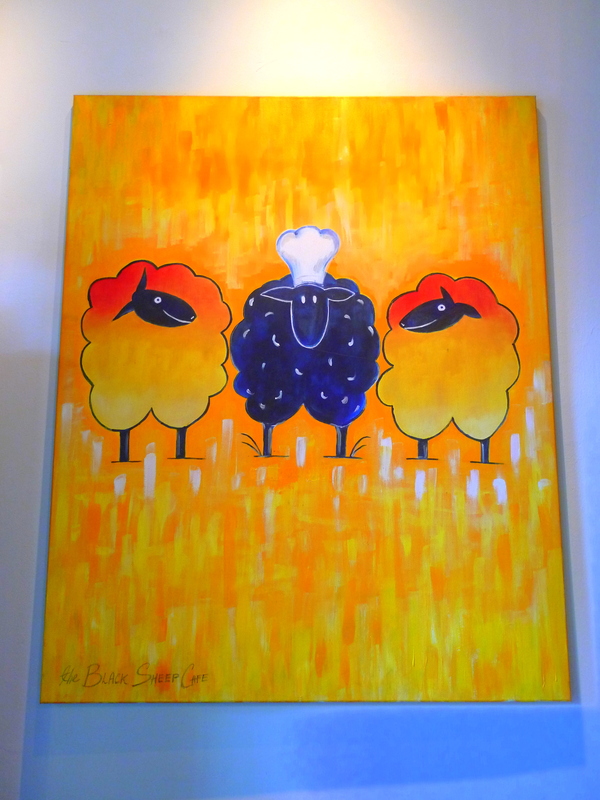 I love the random paraphernalia used to adorn the interior of the cafe, especially artworks of sheep paintings, but it would be greatly appreciated if the general light intensity of the cafe could be increased just a wee bit, to facilitate food photography! I suggested Black Sheep Cafe for dinner with some friends from my SMU bidding group (we call ourselves the Humbled Group…). It’s always good to dine in groups because you get to sample and share a range of items on the menu. Black Sheep’s menu is consise, a euphemism for lacking variety, with a total choice of 4 Starters, 3 Mains & 2 Desserts with the occasional special seafood or meat dish on offer. But who cares about variety as long as whatever is whipped up is good right? 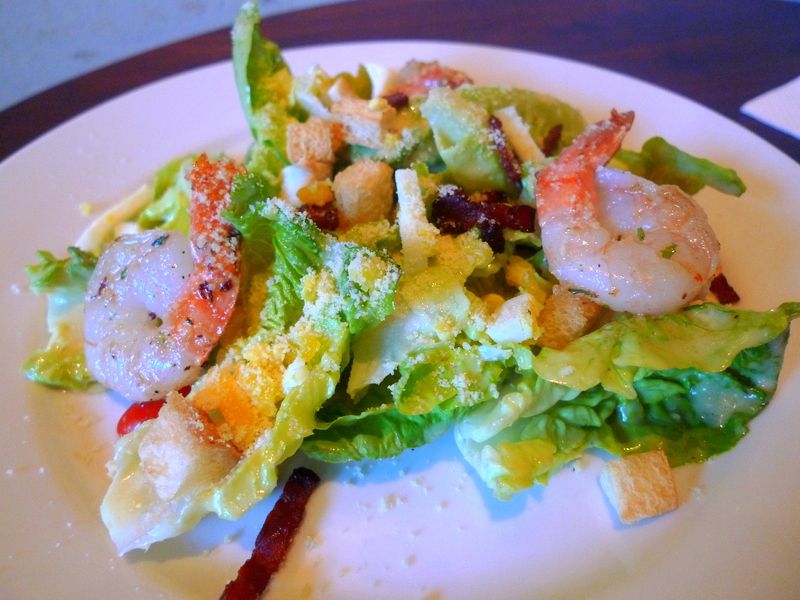 We started off with a Caeser Salad with Garlic Prawns($12.50). The salad per se was nothing to shout about but the addition of small strips of bacon added a nice smokey flavour and the Garlic Prawns were amazingly fresh and crunchy. 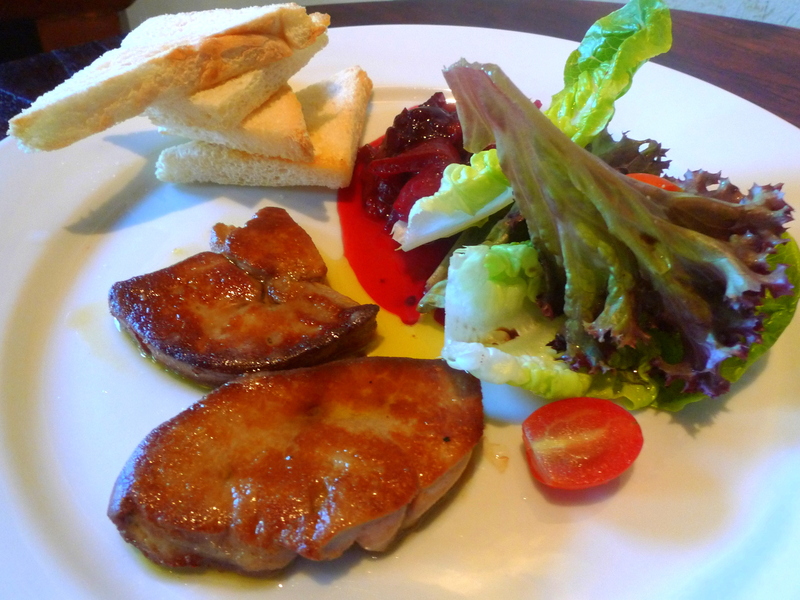 The other starter we ordered was the Pan Seared Foie Gras with Fruit Compote & Butter Toast($22). We all enjoyed the rich goose liver but personally I felt that it was sliced too thinly, with the surface of the Foie Gras not being crisp enough and the inner layers slightly overcooked and not as unctuous or wobbly as I would have liked it. The Fruit Compote was rather unnecessary though, Foie Gras should be savoured on it’s own! 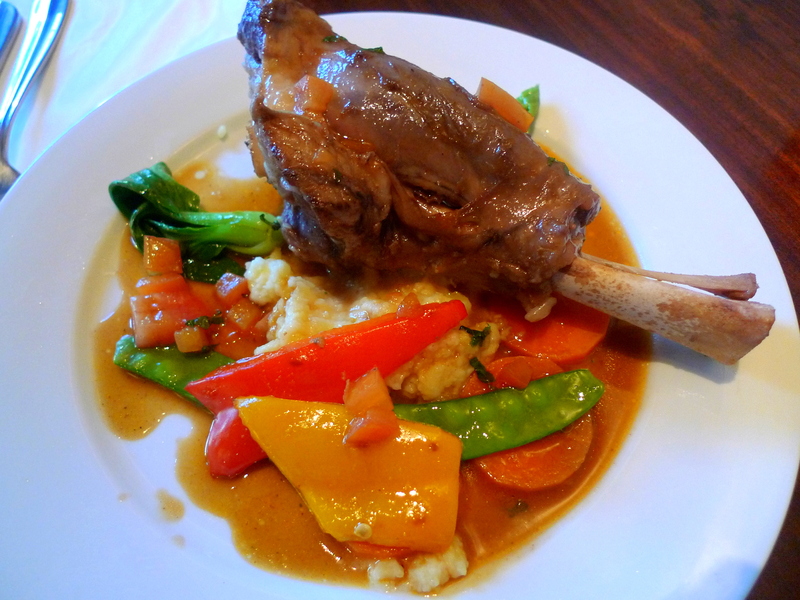 The Black Sheep Shank($22.50) is essentially a “Lamb Shank Braised in Red Wine & Special Blend of Herbs”. It’s definitely one of the better and affordable lamb shanks around, tender with an almost absent gamey taste though it still pales in comparison to the sous vide Lamb Shank at Table 66. 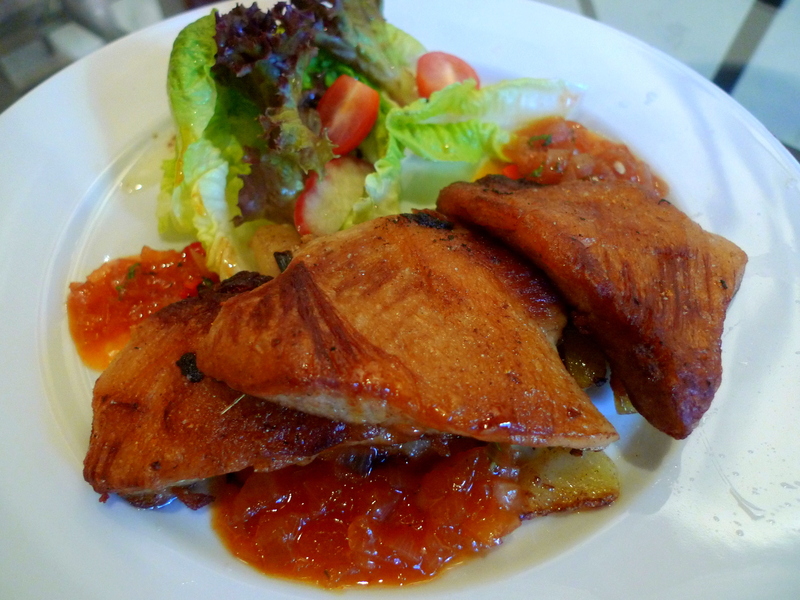 It’s like 燒肉 without the conspicuous layers of fats, the Crispy Pork Cheeks with Roasted Pears, Leek & Orange Glaze($24). S prefers the Jap-style Pork Cheeks better though I find the ones here just nice as long as it is not eaten in excess as it becomes a bit “gelat”, especially with all the other oily and cholesterol laden dishes analogous with french cuisine. Actually, I couldn’t really pinpoint the roasted pears, leek or orange glaze, it tasted more like salsa to me which still effectively complemented the succulent Pork Cheeks. 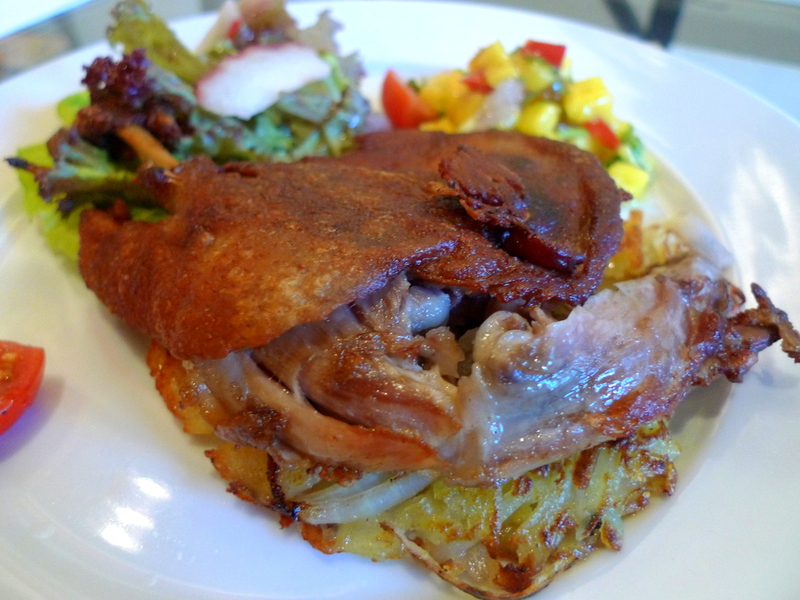 The general consensus was that for the mains, the Duck Confit with Apple Roesti($22.50) came in tops. Apart from the crispy duck skin and fat, the meat wasn’t overly dry, a problem encountered with most duck confits. The Apple Roesti is insanely good too, probably the best roesti I have had since my brush with roesti has been rather limited. The side of Mango relish was symbolically more oriental than french but it’s still a really well executed Mango Chutney in any case and went well with the duck. 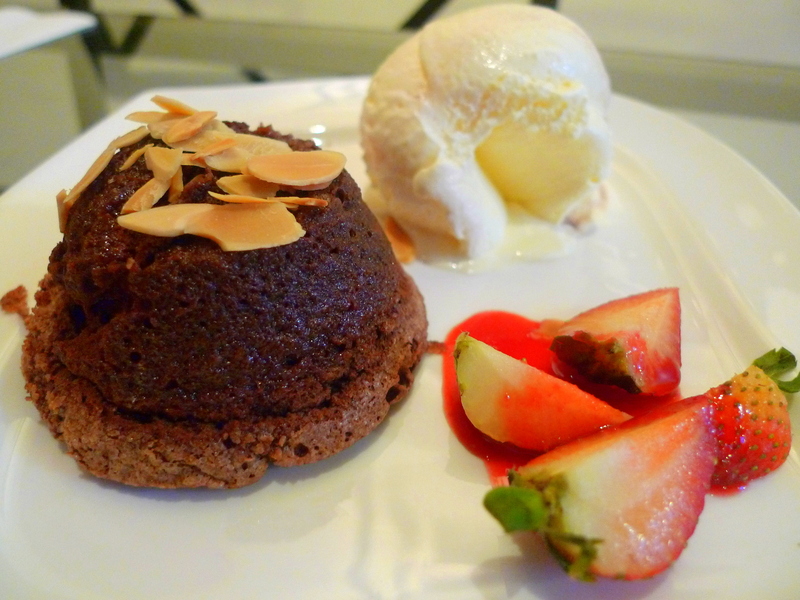 Quite stuffed by then, the 4 of us decided to share just 1 Flourless Chocolate Tart($8). The texture resembled that of a smooth chocolate moose but I wasn’t really taken by it. The accompanying Vanilla Ice Cream tasted rather “cheap” and artificial. Why can’t there be more places like Black Sheep Cafe? Restaurants that are seemingly out of place with a chef that serves a cuisine that is seemingly out of place. Guess what? The GST and Service charge looked seemingly out of place too so Black Sheep Cafe decided to just do away with it. PS: Lunch sets are priced at $16 Nett!